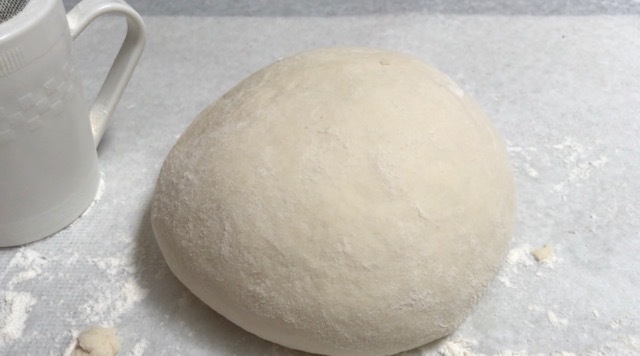 Here’s the pizza dough recipe I use for virtually all of my pizzas. I make pizza year round, but one of my favorite pastimes in the summer is grilling pizza – that’s right, on the grill – using fresh summer veggies. Company loves it because grilling pizza is still a pretty novel idea, not something most cooks have tried. If you like the idea of grilled pizza and you want to give it a go, both this recipe – and a number of grilled pizza recipes – can be found in my new book, The Harvest Baker (Storey Publishing/2017). The Harvest Baker is full of wonderful recipes for baking with the harvest – fresh veggies, fruits, and herbs – throughout the year. For starters, you can try the recipe for Grilled Flatbread with Hummus and Veggies. Pour the water into a spouted 2-cup measuring cup. Stir in the sugar. Sprinkle in the yeast and mix with a fork. Set aside for 5 minutes. Combine the flour and salt in a large capacity (at least 10-cup) food processor outfitted with the standard cutting blade. Pulse several times, to mix. Stir 2 tablespoons olive oil into the yeast water. With the machine running, pour the liquid through the feed tube in a continuous 10-second stream. When the mixture forms a ball, continue to run the processor nonstop for about 8 to 10 seconds of machine kneading. Turn the dough out onto a lightly floured counter; be careful, because the dough will probably be stuck to the blade. Knead the dough by hand for about a minute, until smooth and supple. Smear a teaspoon or two of olive oil in a large bowl. Place the dough in the bowl, turning it to coat the entire surface with the oil. Cover the bowl with plastic wrap and set it aside in a warm, draft-free spot until doubled in bulk, 45 minutes to 1 hour. Once it has doubled, punch the dough down and proceed with your recipe.